Having a deck improves the outdoor appeal of any home. They can be used for so many different occasions. Decks are a great addition to any home. f you want to improve the look of your deck or add an extra element to a new deck, then consider building deck railings. Deck railings are a nice flare you can add to your deck. It’s also an added safety feature. If you have an elevated deck, you should contact your local government to make sure you can build and are following all laws and ordinances. If you are not familiar with your local laws then call the city or state you love in. You will need to make a plan and gather your building materials. Building your own deck railings can save you some money and help ensure the safety of your family and friends. 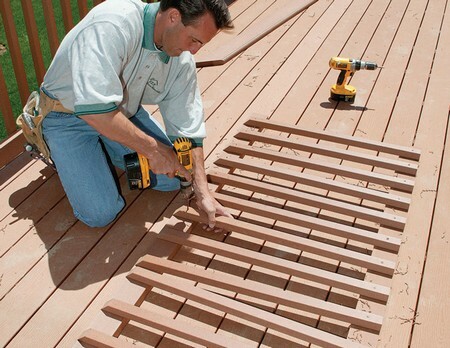 Here is how you can build your own deck railings. Read on to find out how. Come up with the design of your new deck railings. Make sure this design is in complete compliance with your state and city building codes and ordinances. The spindles on your deck railing should be evenly spaced and be 9 inches apart. The railings should measure approximately four feet high. You should allow a little extra length so the rail is flush with the bottom part of the deck. Decide the amount of wood it will take you to complete this project. Trim the 2×2 inch wood boards to the correct length for the spindles. Make two holes into both spindles. You should have a hole 1 1/2 inches from the lower part of the deck. The next hole should be positioned at 1 1/2 inches from the upper part of the outside of the deck. These holes are markers. They can not be larger than the size of your carriage bolts. The spindles should be bolted into place with an electric screwdriver. This adds strength and stability when you utilize the carriage bolts. The spindle pieces need to be flush when placed against the lower portion of the new deck. You need to measure all components very precisely this step. Any mistake will show in the results and will be very prominent. Trim the 2x4s to the correct length. Use screws to join the spindle pieces together with screws. Attach both 2×4 sections to construct a joint to ensure easy attachment if you have to. Stain your railing the same finish as your deck. The two should match. Enjoy your new deck railings.